This Barking Wednesday is a sad post. Kingers passed away on December 27th, 2014 from a brain tumor. In December of 2013 Kingers had his first seizure. He was tested for all things that would cause a seizure. All test results came back negative. The only other reason for the seizure would be a brain tumor. The test that would detect a brain tumor was a MRI. The MRI cost $3,000. We decided to not have a MRI - treat him with medicine and pray that his tumor does not grow. Taking the medicine Kingers did not have another seizure until December 27th ~ the medicine stopped the seizures but was unable to stop the tumor from growing. The Friday after Christmas I left on my trip to visit my Mom for the holidays. On Saturday morning...Kingers had a terrible seizure on our deck. 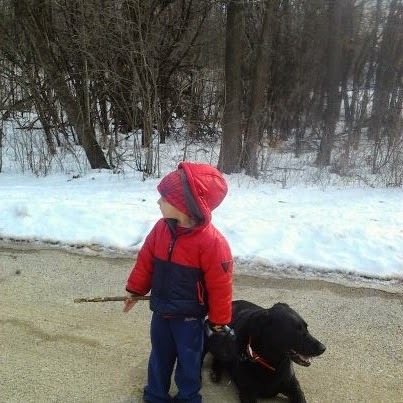 Terrible seizure causing him to loss the ability to control his hind legs. My hubby,daughter and son in law immediately took Kingers to the vet. His vet of almost 12 years felt that the brain tumor had grown in size causing the seizure and the inability for him to control his legs. With many many tears - my hubby and I decided to end Kingers pain sending him to heaven. My hubby and son in law stayed with Kingers while he fell asleep for his final nap. Kingers was born on May 3rd, 2003. We purchased him from a friends sister that had a litter of 9 Lab Puppies. I remember his first ride home ~he cried like a baby the whole trip. King got his name from our motorcycle - a Harley Road King. We are extremely sad that Kingers died ~ but I have 11 1/2 years of fun memories. When he was 3 months old I registered for Puppy Kindergarten. I went dressed in my business suit and Kingers was ready to learn. After the 1st class..the instructor asked that we not return. I was shocked! Since King was so friendly he was definitely distracting others! We got in the car, came home and told Dad we have been kicked out of Puppy Kindergarten. We still laugh about that! Who gets kicked out of Puppy Kindergarten?? King & I! The Kindergarten teacher will never know that King went onto being one of the BEST Therapy Dogs! I worked in healthcare and he came to work with me every day for 6 years. Patients loved him! He made a huge difference in their quality of life. He was extremely well trained! Guess Miss Negative Puppy Kindergarten Teacher should of given him more of a chance! of many a laugh the whole camping weekend! The lady with the blue feet! The Fox Spotting Adventure with Davey - February 2013! Check out this pic! They were both looking for foxes! Davey looking one direction and Kingers the other. I laugh at the pic...they both have each others back! When I retired so did he..we spent our days goofy off and trying new items. He was always right there with me while I blogged, tested products, or worked outside. He was always by my side and never asked anything of me. He loved me no matter how I felt! My hubby and I were his life! He loved the children and grandchildren and everything that involved us! He slept in our bed until he could no longer jump or climb stairs. He ate the best food, wore the crazy collars and always had the latest toys. 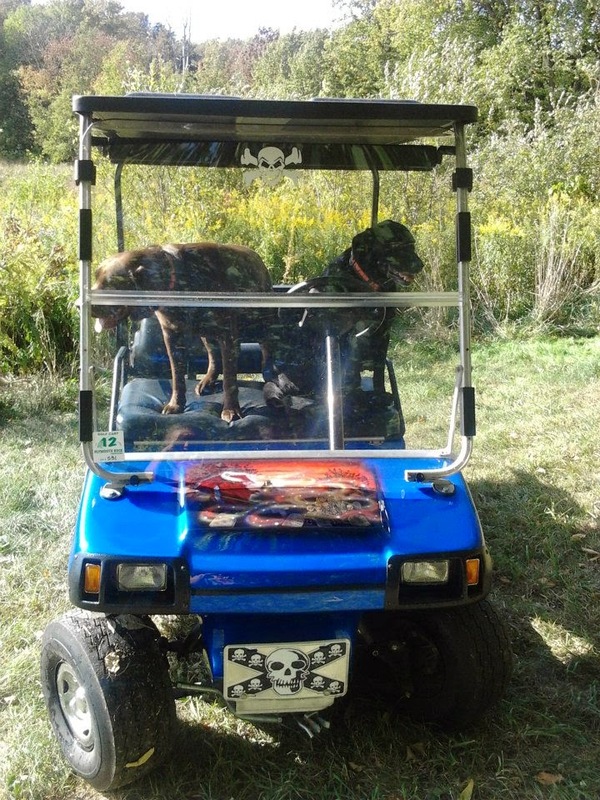 He loved to go to the camper and LOVED to ride the golf cart! Isa traveled with me to my Mom's...when I explained what had happened to Kingers - Isa was so upset. I explained how now Dozer & Kingers are together. Kingers joined him in heaven. Dozer and Kingers were the bestest of friends! Now the two of them can play and ride golf carts all over heaven! Dozer (Grandpuppy) passed away in April of 2014 from Bone Cancer. We lost two amazing companions in one year. Our house is quiet - no more nudges with his nose. Our eyes are red but our hearts are packed full of fantastic memories of him. He will never be gone..he will live on forever in our hearts. Kingers we love you and miss you so much. Kingers and my dog Flag looked a lot alike. She passed away a few years ago, but I bet they are playing together over the rainbow bridge. I'm so sorry for your loss. It's never easy losing a family member. We have a dog now, but it took me YEARS to get him after my first dog passed. It was just too hard. I am so sorry to hear about Kingers. The loss of a family member is never easy. Really sorry to hear about Kingers,I have no idea what I will do when either of my two go they are such a big part of our family. Got tears in my eyes as my heart hurts for you. I still miss my sweet dog (that was my first baby) and it's been 14 years. Kingers was so lucky to have you as his family. I'm so sorry for your loss. Loosing a furry member of the family is just as hard as loosing a human member. 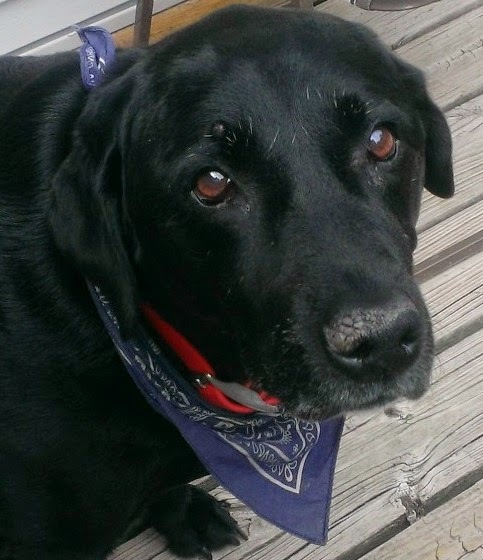 I'm so sorry, we lost our lab of 14 yrs last summer. It was SO hard, we cried for a week and we still miss him! Dogs are such a big part of our families! Praying for you!! So sorry for your loss. Sending love and light to you and your family. I'm so sorry to hear about Kingers' passing. Loosing a furry family member is hard, but the memories make it worth the pain, I think. Hugs! Loosing fur family members is always so hard, I am so sorry for your loss. I'm so sorry for your loss. Animals are such an important part of the family. I'm so sorry to hear this. It's always hard to lose a fur baby. They are really just like family. I am sorry for your loss but feel blessed you had your pup for 11 years as I have heard too many dogs die from cancer at a much younger age, so sad. We are their whole life and I know he lived it fully with you as his parents. Sorry for your loss. Those guys tend to work their way in your heart even when you don't plan two. My hubby and son got two Lab mix rescues. They were about 2 months old when we got them and even though I didn't really want the dogs, but they are now a part of our family. I echo the sentiments of everyone here. It is so hard to lose a friend, and to recognize their absence regularly. I will definitely think of you and send thoughts of strength and comfort. I so loved hearing about Kingers every week. Such a good friend. I'm so sorry for your loss. Our sweet Newfoundland died two years ago and we still think about her every single day. I know how hard it is to lose a beloved furry friend. I am so sorry about your loss. We lost our fur baby a few months ago. I know how you are feeling. Oh my goodness. I'm so, so sorry. We lost our furry friend, Oliver, 3 years ago and it is so difficult. I am so sorry about Kingers. It is hard when you lose a pet that you have had for so long. By that point they are not just a pet they are family. Thank you for sharing your memories with us. Absolutely heartbreaking! My pug passed away from seizures 5 years ago, and this post really brings tears to my eyes. So sorry for your loss! I am so sorry to hear your dog passed away. I hope you and yoru family find comfort. So sorry to hear, our beagle/lab had a tumor in her leg, she passed a few years ago, it is so hard when they leave us. I truly am sorry about your dog's passing. They truly become a part of our hearts. I am so sorry for the loss of your dog. They are like family. I have been through it a couple times and it is always heart wrenching. A new little puppy for Valentines Day would be perfect! :D Love and hugs. I am SO sorry for the loss of your dog Kingers. I know it must be a hard time for your right now. Just know you are not alone, there are people out there who understand. I lost my Cain in 2012 to a brain tumor as well. He started having seizures and the MRI here was $5000. We opted not to have it and he was put on medication. We got just over a year with him before the cancer had spread to his abdomen. We did get another dog later in the year to keep his sister company, but I still miss Cain and think about him all the time. I choose to believe that we'll see all our pets that have gone before us when its our time. I'm so sorry! I lost my fur baby four years ago and it still stings. Hugs! They really are a big part of the family. Kingers sounded like an awesome dog. So sorry. What a beautiful dog. I am so sorry for your family's loss. So sorry for your loss! My mom's dog passed away last year - so hard! Our pets are such an integral part of our families. It is always heart-breaking to have to say goodbye. I'm sorry for you and your family. Know that Kingers is watching and waiting to be reunited with you.